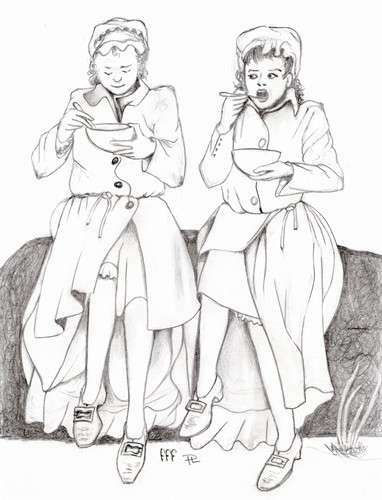 Port Jackson November 1788, convict girls Ann Daly (Warburton) and Amelia Levy were sharing a hut together. A fire was kept lit between their hut and Ann Farmer; sometimes in the evenings John Ryan and Bartholomew Reardon took advantage of the warmth from the fire. During the evening of 11 November a man had come into the girl’s hut and taken some clothing. Ann claimed that she was lying awake in her hut when the door opened and a man came in. She thought the man had come in after Amelia Levy, a loose girl, who slept in the same hut. She turned her back but saw the man leave five or ten minutes later. Getting up to fasten the door, she missed an apron, a pair of trousers and some sheets. The next morning Ann found a bundle on her doorstep which contained the missing things from her hut. John Ryan was taken into custody accused of breaking and entering and stealing from Anne Warburton’s hut. Amelia Levy, in the same dwelling. Ann Warburton, Amelia Levy (who took oath on the Old Testament), Ann Farmer, Bartholomew Reardon (alias Bartlett) and Francis Fowkes gave evidence. John Ryan was acquitted. Ann Daly the wife of Gore Daly (widow) otherwise called Ann Warburton, late of Cheadle Buckley, was tried on 3 October 1786 at the Quarter Sessions held at Nether Knutsford, Cheshire on suspicion of theft on 25 January 1786. She was found guilty of stealing a printed muslin gown and yellow silk gown worked in a running Pattern with Silk of different Colours from Mary Anne Miller. Sentenced to seven years transportation Anne was brought from the Cheshire goal on 14 March 1787 and delivered direct to the Prince of Wales. In Port Jackson on 24 June 1792 Ann married First Fleet convict John Seymour at Parramatta. John Seymour arrived aboard the Scarborough having been tolerably decent and orderly on the Dunkirk Hulk before embarkation. Sentenced to seven years transportation at Sherborne (Dorset) Quarter Sessions on 25 April 1786 for feloniously cutting, lopping and topping one Maiden Ash Timber Tree at Beaminster being the property of William Buckler of Boreham, Wiltshire, then aged 25. Port Jackson Monday 16 June 1788, a bench of magistrates sat. Daniel Spencer, John Seymour and John Ferguson were charged with stealing three pounds of flour, and one and half pounds of meat, the property of Henry Barnett, John Coffin and John Rowley. Barnett and Coffin gave evidence. They said that, on the 12 June the accused called at their hut at the Farm and some cakes and pies were missing from the oven after they left. The prisoners said they had not gone near the oven and had given Barnett and Coffin permission to search their hut. Spencer, Seymour and Ferguson were discharged for want of sufficient proof. John received a 50 acre grant at Field of Mars on 28 May 1793 a year following his marriage to Ann Daly. Ann Seymour was buried at St John’s Parramatta on 21 April 1798. Her grave is unmarked and the location unknown. John Seymour died 29 July 1802.